This is an slightly misty, early(ish…about 08:00) morning photograph taken a week or so back -I spotted the top the mast as I came out of the Underground at Canary Wharf, so decided to take a look. 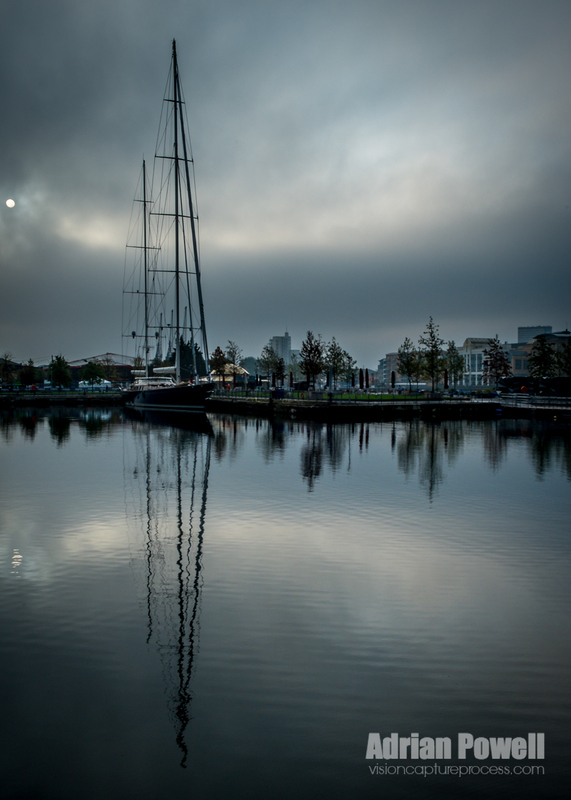 Quite a moody photograph, with a great reflection (about as good as it gets around here…the wind is always funnelled around the offices here) – perhaps a long exposure would have made this better, but I did not have a tripod with me. Edited in Lightroom 5.6 – improved levels, graduated filter to darken sky and a graduated filter from the bottom to darken the water, cropped and sharpened. Ah, an astronomy photograph at last! Good shot. The mist with the reflection made this picture. I guess your curiosity was worth it!